In June, the Union ministry of housing and urban affairs released the Swachh Survek-shan-2018, which had the rankings of 4,203 cities on sanitation and municipal solid waste management (SWM). I have serious problems with the ranking as well as the message that the survey is sending out to cities and citizens on SWM. Let me elaborate. The survey has awarded cleanliness, but has not recognised sustainable waste management practices. Moreover, it has failed to reward decentralised citizen-driven initiatives. The majority of the top 50 cities may be visibly clean, but do not have appropriate systems for processing and disposal. They collect waste and dump it in poorly managed landfills and dumpsites. Take the case of Chandigarh, which has been ranked as the third best city. It has no effective system to segregate waste at source and the city’s processing plant is caught in a legal turmoil. The New Delhi Municipal Council (ranked 4) and the South Delhi Municipal Council (ranked 32) do not collect or segregate waste, and 80 per cent of waste processing happens through poorly maintained waste-to-energy plants—the Okhla plant has been under intense scrutiny for causing pollution. Similarly, cities such as Tirupati, Aligarh, Varanasi and Ghaziabad—all ranked highly—have no proper processing and disposal mechanisms in place. It is shocking that the survey has poorly ranked cities that actually have sustainable waste management mechanisms simply because these cities do their waste management in a highly decentralised manner and do not depend on door-to-door collection of waste by the municipalities. Take Alappuzha (ranked 219) or Thiruvananthapuram (ranked 286) in Kerala for instance. 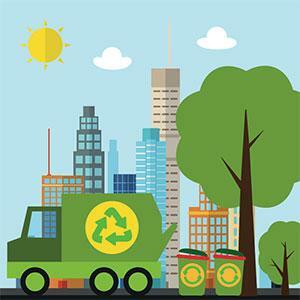 These cities received low rankings because they had adopted household and community-level waste management systems. Most of the waste in these cities is converted into compost or biogas at the household or community-level itself. Inorganic waste like plastic and glass, is sent for recycling. These cities make money from solid waste, rather than spending crores of rupees in collecting and transporting waste to landfills. And these cities are also clean. To say that Varanasi is cleaner than Thiruvananthapuram is difficult to digest. So what model is Swachh Survekshan propagating? Is it a model that is capital intensive and involves door-to-door collection, segregation, centralised processing and disposal in landfills? Or is it propagating a low-cost model like that of Alappuzha or Ambikapur in Chhattisgarh which is based on segregation, decentralised processing, recycling and reuse of waste. And there are no landfills or protests over landfills in these cities, like the one happening in NOIDA right now. Unfortunately, the survey results convey the message that visible cleanliness is more important even if cities practice unsustainable waste management practices. The truth is a majority of towns and cities cannot afford the highly capital intensive and centralised landfill-based model. They need sustainable low cost models. A SWM system that makes money is more likely to be sustainable than those that bleed the municipalities. The Swachh Survekshan-2019 must keep this in mind. (This article was first published in the 16-31 July issue of Down To Earth under the headline 'Sweeping verdict').